FlashcatUSB Mach¹ is the fastest NAND programmer available. Supports SLC, MLC, and TLC devices. FlashcatUSB Professional: increased performance, high-speed USB (480mbps), low-voltage support, 1.8v and 3.3v and integrated CPLD for logic applications. FlashcatUSB Classic is a Flash memory programmer capable of reading and writing data to thousands of different devices using multiple protocols, such as JTAG, EJTAG, or SPI. Comes with easy to use Windows based software. FlashcatUSB xPort combines both a Classic and Extension Port adapter to create an easy to use, low cost, and powerful programmer to read/write to NOR and SLC NAND Flash memory. We offer a full range of easy to use sockets and adapters for serial Flash and EEPROM memory, including SPI and I2C. 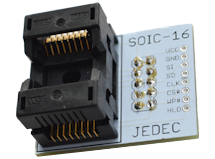 Packages supported includes SOIC-16, SOIC-8, WSON-8 and DIP-8. Sockets and adapters for parallel NOR and NAND Flash memory devices. Support for PLCC-32, SO-44, DIP-32, TSOP-48, TSOP-56, BGA-64 and BGA-63 packages. This kit is for connecting your computer to a device using a standard RS-232 serial (DB9) port on your computer with a TTL console port on your target device. This type of kit is commonly used on devices such as routers or other networking equipment. 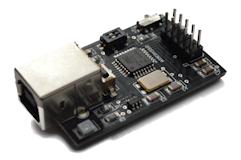 This easy to use device can be used to make a wide range of devices wireless in seconds! So instead of running long cables, you can use this low-cost kit to create a wireless bridge. For example, you can use this kit to make a USB printer wireless without needing expensive equipment. These are very popular gold-plated connector pins that allows you to connect a standard 10 pin IDC ribbon to a test access port without the need for soldering. Available in 5 or 10 packs. This standard cable is used to connect a computer's serial port (DB9) to a embedded device with a 3.5mm diagnostic port. Communication is done using standard serial protocol software such as SecureCRT or Hyperterminal.